Hey Dwayne "The Rock" Johnson, we smell what you are cooking, and this time, we don't like it. 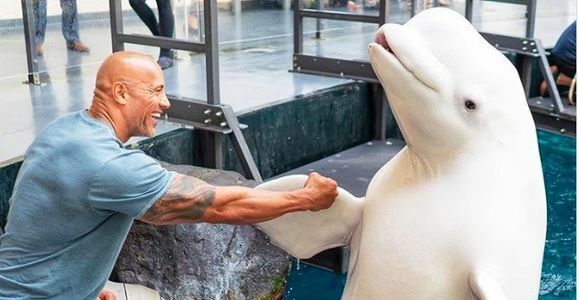 This week, superstar The Rock took time out of his busy schedule to visit the Georgia Aquarium, a huge marine life museum that holds more than 100,000 creatures. The actor took to Instagram to share some photos of him and his family enjoying an up close and personal experience with some of the animals. His 112 million followers got to see him staring in awe at the aquarium's whale sharks, posing next to a seal, and shaking "fins" with a beluga whale. But this time, many of his fans weren't pleased with what they saw. Specifically, his animal-loving fans took issue with his using his platform that reaches millions to glorify the terrible practice of marine animals like whales and seals in captivity and using them for tricks. In an Instagram video in which he appears with Katie the seal, he says, "I am one with creatures and animals and basically anything with a heartbeat." But people are wondering how can he support animals forced to live in permanent captivity if he really is one with them? It's a good question. Marine animals held in captivity rarely have an enjoyable life. They are forced to live in over-chlorinated water, do tricks for the public, live in tanks a fraction of the size of their natural habitat, and endure a life of utter boredom. Most people who love animals would rather avoid institutions like the Georgia Aquarium and SeaWorld that use cetaceans and other marine mammals for profit. We all still love The Rock. It's normal for people to make mistakes. But we think it is important for someone like with such a huge platform, to take a stand against the practice of animals in captivity, especially marine mammals. That's why Care2 is asking for The Rock to please take some time to make a public statement against animal entertainment and donate to an animal rights organization.